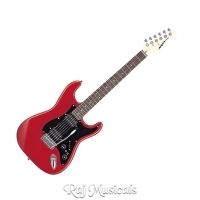 Aria STG005 Electric Guitar high quality guitar for everyone, comes with basswood body, maple neck, rosewood fingerboard, 22 no. of frets..
High quality guitars for everyone. That is Aria’s credo over 50 years of its history.STG-Series really stand for it, with simple but rich specs at marvelous value. Your sound is already there! Finishes: Black (BK) and Metallic Dark Red (MDR).